The Aerobie Aeropress ($26 ), coupled with the Hario Slim hand mill ($33 ), is my favorite coffee kit for traveling, and home use. (To save a couple bucks on both, buy them together here for $54 , thanks to Steve in the comments). They’re both light weight, easy to keep clean, relatively self-contained, and cheap. Sure, if you’re traveling you could bring a trendy pour-over filter, like the Hario V60, but then you need to bring a kettle which adds weight and bulk. Start heating your water. By the time it’s boiling you’ll have everything else set. Rinse the paper-filter in the filter-holder under warm water to minimize any paper taste. Grind your coffee and put it in the upside-down Aeropress. I use ~16 grams, ground the same as I’d use for the V60 pour-over. If you have the Hario Slim, then I have mine set between 8-10 clicks from the finest setting. Grind size is difficult to describe, so you’ll need to taste and adjust until you get this right. (In this case, if it’s too strong, and verging on bitterness, you’re probably too fine; and if it’s a bit watery, light, or sour, you’re probably too coarse). Take the water off the heat and let it sit for 20 seconds after it’s reached a high boil (large bubbles). If you like, you can check the temp on a thermometer. I’ve found that this brings the water temperature down to about 195F with the pan I use to boil water. When poured into the Aeropress, the brew temperature drops to about 180-175F. Some people prefer a lower temperature of 176F to start with, but I haven’t tested this enough to have an opinion. Pour the water in. I generally pour about 230ml of water, which takes me up to the top of the Aeropress chamber. Be careful not to overfill, and be mindful of bloom (released CO2 gas) that will occur with very fresh coffee and might cause overflow. You can use the remaining hot water to pre-heat your cup. Stir, wait 2 minutes, and stir again. I stir once right after I’ve filled the chamber, wait 2 minutes, then quickly stir again, place the filter on, put the mug over top to prevent anything from leaking, and flip the whole assembly over so that I can start pressing. I don’t press hard, it usually takes ~20-30seconds for it to fill the cup. Stop before the hissing sound. Some people argue that you should press until the bitter end, but, if you move the Aeropress to another cup and taste the last bits of the brew, I’m pretty sure you’d rather not have that going into your cup. It’s thin and bitter by that point. After you’ve done it a couple times it’s actually pretty simple. There are quite a number of different techniques detailed over at Brewmethods.com, but this combination of styles is the one that’s gotten me the most consistent, full potential of the coffee. There’re many different methods, though. If you have a favorite, or a suggestion, post it in the comments! In the photos you can see a few shots of coffee prepared on the Aeropress. It’s an essential piece of luggage any time I travel. I’ve even taken it with me to brunch at the Seoul Grand Hyatt for some guerrilla brewing (shown above, with more info here). 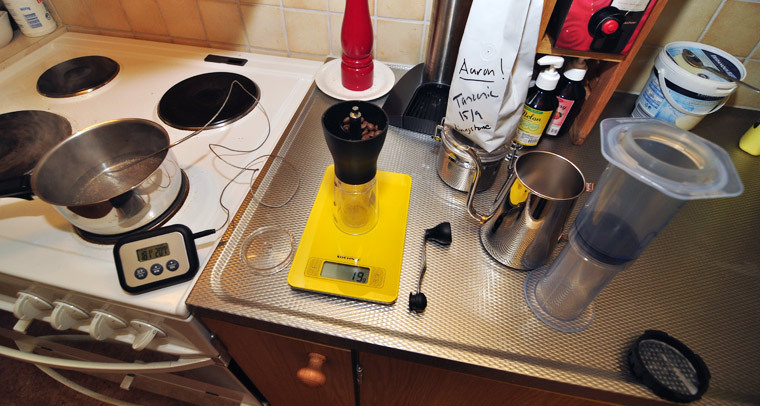 The Aeropress makes enough coffee to share, if you’re happy with quality over quantity. Seen here during my trip to Tokyo. Here’s a shot at my apartment in Sweden, going the extra mile with scale and thermometer. I was playing with some sample roasts from Solde Kafferosteri, watch out for a review soon, these guys run an up-and-coming cafe & roastery based in Malmö, Sweden. 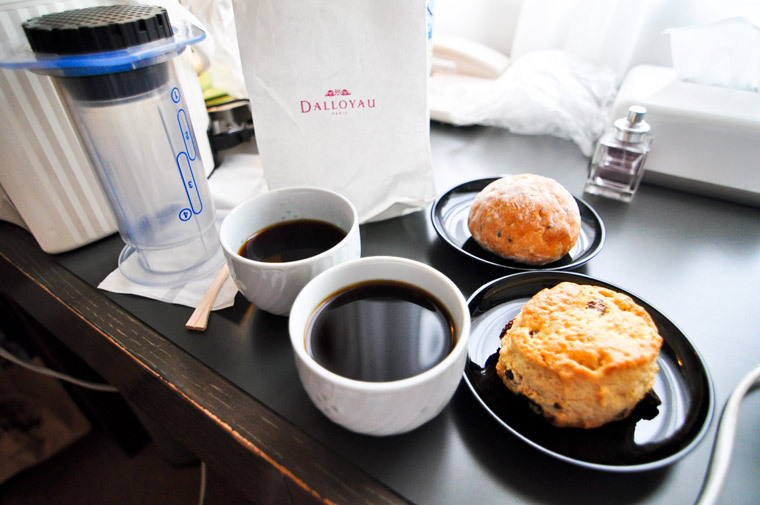 In the last image, you can also see the Hario Slim mill. I also have a Kalita hand mill, which works similar to the Hario Skerton, but I perfer the Hario Slim because it has an easy to adjust grind setting on the bottom. I’ll do a more in depth review of that in the future! I know it’s pod coffee, but the thing was half price (there’s another version that takes grinds, but couldn’t find it for less than $150), but I can sacrifice on quality to be able to be carrying around an espresso maker in my briefcase. Good idea, I’ll look into that. 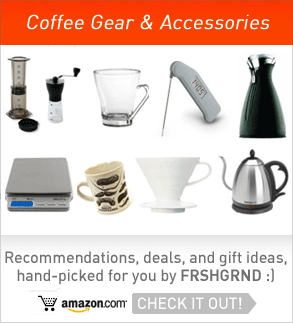 Wow, that grinder/aeropress deal is actually pretty slick, nice find! I can’t say much for the Handpresso, though. I haven’t heard any good things about it (mostly negative), whereas the Mypressi Twist (which I think you’re referring to) has just been upgraded with a new model and gets lots of good reviews. But let me know if you end up liking the Handpresso for what it is. Looked into that MyPressi Twist. Trying to cancel my order of the Handpresso now. Even if I can’t, I may buy the twist anyway. Yup. 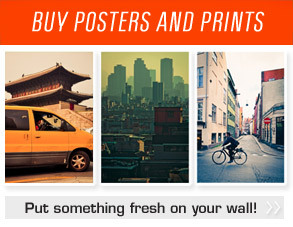 Bought the MyPressi. Even though it’s not as portable, I’ll finally be able to make very good espresso at home, supposedly. Cool, what kind of grinder will you be using it with? I’ve managed a decent espresso using a hand-grinder (on a big espresso machine; haven’t tried the MyPressi yet). And, from what I’ve read, if you take the time to pre-heat all the Mypressi components with boiled water, it’ll make a good espresso shot. I bought that exact aeropress/mini mill grinder combo at the link above. In other words, the exact setup you recommend in this blog entry. I don’t have the most distinguished palate but I like it. Why would you need to bring a kettle if you have a pour over filter, but not if you use an aeropress? Pour-over (i.e. pass-through) brewers like the Hario V60 especially, but also the Melitta, Kalita, and similar designs, all demand a bit more finesse and control over the flow rate and agitation when pouring, which is why most users buy a kettle with a long pouring spout. You can do away with it, but it is a little harder to get a consistently good cup. 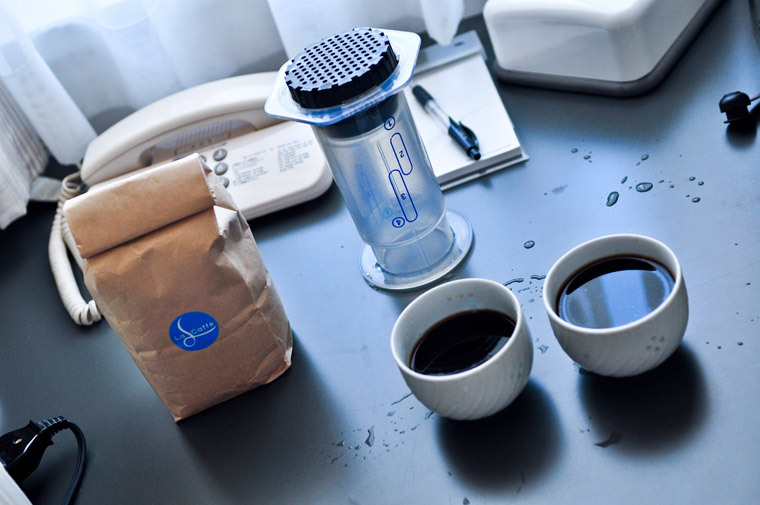 The Aeropress doesn’t need one because it’s typically used as an immersion brewer, so the pouring step is less important — simply fill it up by pouring from whatever you used to boil the water. In my observation, the “hiss” part doesn’t affect the cup too much either way. I’m also in NY, for what it’s worth, and I find 2:00 minutes is about right. At 1:00 minute the body isn’t as developed and it’s still too bright for my tastes. Great to hear! However I’ve found this method a bit difficult to work with since moving to NY. It may just be the pipes at my old apartment or something else, but I was finding anything steeped longer than 50 seconds overly bitter. Strangely, switching to a Kalita Wave has solved that problem even if I pour for around 2:30. A bit baffled by it, but too busy to get to the bottom of that mystery.